ObamaCare — or the Patient Protection and Affordable Care Act, as it's officially known — was signed into law with the best of intentions. Yet very few Americans are prepared for its coming changes. Do you understand what ObamaCare's 2,700 pages mean to your life, your wallet, and your health? Fortunately, now there's help . . . 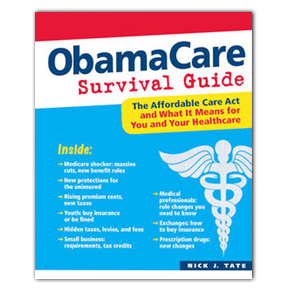 In the ObamaCare Survival Guide, written in simple language by award-winning journalist and health author Nick J. Tate, you'll discover how this massive overhaul to our healthcare system will impact your life — even your relationship with your own doctor — in the coming days. Despite its positive goals, the Affordable Care Act contains 5 major changes you'll have to navigate successfully if you want to use it to your advantage (hint: with change #1, our nation's seniors will be particularly affected). That's why you need this "Guide" at your fingertips. This book has been called the "thinking person's guide to ObamaCare — chock-full of insightful analysis, clear-eyed perspectives, and practical consumer advice." 5 major changes that could trip you up when it comes to the new laws and your healthcare benefits . . . The ObamaCare "scorecard": winners and losers under the new rules . . . Retired and under 65? Will ObamaCare help or hurt you? Exactly how the new rules will benefit those with pre-existing medical conditions . . .
How the Affordable Care Act presents a financial windfall for Big Pharma . . .
How you, the taxpayer, will foot the bill for about half of ObamaCare's funding in the form of new taxes and fees (one "surtax" in particular threatens American homeowners) . . .
2 reasons why insurance companies welcome ObamaCare, despite the legal regulations imposed on them . . . The good news for seniors: the "donut hole" in Medicare prescription drug coverage will finally be filled . . .
How the new law deals with controversial issues such as coverage for abortions and contraceptives . . .
Why those with high incomes may save money on their own healthcare plan, but will also pay more to help fund healthcare for the rest of the population . . .